To make the salad: warm a large frypan over medium heat. Add the oil, potatoes, salt and pepper. Cover and cook, stirring occasionally, until the potatoes are brown and tender, 7 to 9 minutes. 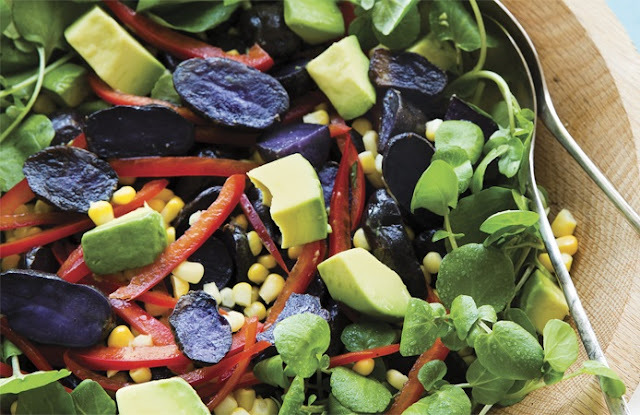 Place the watercress in a salad bowl or on a large platter and scatter potato mixture, capsicum, avocado and corn kernels on top. To make the dressing: in a bowl, whisk together kefir or yoghurt, lemon juice, honey, oil, goji berries, garlic powder, mustard and salt (if using) until smooth. Sprinkle in chia seeds lightly drizzle over the salad and serve immediately. CHEF’S NOTE: chia seeds will absorb liquid and make the dressing too thick if allowed to sit. To make the dressing in advance, combine all the ingredients except for the chia seeds and chill in the fridge, then stir in the chia seeds just before serving. NUTRITIONAL INFO PER SERVE. 352 calories, 17g fat (2g saturated), 45g carbohydrates, 9g fibre, 8g protein, 403 sodium. End.